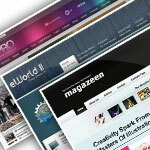 The author of released a rich collection of premium Joomla themes to download for free. You can navigate through his archives and watch a live demo of each theme and you can download it for free if any of them catch you. My personal favorites are listed below. The Magazeen theme originally was created for WordPress, but it got transformed fast to support Joomla. The name describes the theme. It was designed to be a performed magazin template. It has a clean and great design with a blue, dark gray and pink color scheme. The Meridian theme of RocketTheme’s is a new premium Joomla template. To enlist some of its qualities: integrated AJAX based modules, fresh colors, Joomla 1.5 support, etc. The dark edition of GK eShop theme caught my eye by its amazing professional, elegant, slick dark design. Besides its clear design, it also has multiple color schemes, PhotoSlide GK2 and News Show GK3 included. Really cool collection of templates. Thank you and sucess!. Can anyone provide a few suggested template galleries for Joomla?